Lighting fixtures are an essential component in your home. Every room needs a particular type of lighting. Lighting usually has one basic purpose and that is illuminating a room or specific area. You can change the look of a room with the perfect design choice and placement. Selecting the best lamps for your home can be tougher than you think. When deciding what type of style you are looking for, it is important to take into consideration what the area will be used for. There are many different lamp styles to choose from and certain ones will fill different needs. There are 3 major categories, the table lamp, the floor lamp and the desk lamp. The table lamp can be used as a reading light, but in most cases, it is used more as a decoration. This type of lamp doesn’t usually give off enough light to brighten a very large area. Floor lamps can be practical and decorative. Most floor lamps are used in a corner of a room or in between pieces of furniture. Desk lamps are great for work areas. Light is direct and concentrated in one area. Most of these lamps are adjustable or have a gooseneck. 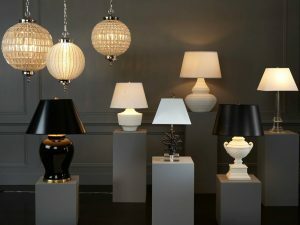 The following is a list of different lamp styles that you need to know and their benefits. Crystal table lamps can add elegance to a room. Crystal is usually clear or faceted and can reflect light adding sparkle to a room. Add one lamp for subtle impact or use a pair of them to make a bold statement. If you have other crystal fixtures in the room try to match them for a more unified look. Tiffany glass was created by Louis Comfort Tiffany in the 19th century. This style incorporates an elaborate stained glass design. Authentic Tiffany lamps are very expensive and can cost anywhere from a few thousand dollars to more than a million dollars. Lucky for those of us on a budget we can purchase a “Tiffany style” lamp at a fraction of the cost. Replicas of these lamps are often used as accent lighting. The themes portrayed on the Tiffany-style lamps can be Art Deco, Victorian, and Mission among others. The gourd lamp is a classic table lamp that is characterized by its rounded, curvy type base that resembles a gourd. Most are made of ceramic, but can also be found in glass and metal. These lamps are often used in accent lighting and can be used alone or in pairs. Candlestick lamps, also known as buffet lamps, get their name from their shape. These lamps are tall and slim with a tapered form that can add charm to a room. The slender shape of these lamps is an advantage because they take up very little room. These lamps are often used in formal settings and work well in pairs on a table or buffet and are great for dinner parties. Chinoiserie design appeared in the mid to late 17th century. This type of design incorporates a mixture of Chinese and European design styles. Elaborate Oriental scenes are characterized through a romanticized image of how Europeans believed people in the Far East lived. Adding Chinoiserie décor to your home can add a touch of elegance and history to your room. The glass of Mercury Table Lamps adds a mirror-like look to the base. Mercury glass doesn’t actually contain any mercury. It is made by using clear glass blown into double-walled shapes and then a silvering formula is added between them. Gold table lamps look sophisticated and come in a wide range of finishes and tones. These traditional lamps are timeless. Arc lamps are slender with an arc-shaped arm that extends outwards from the body. These lights are often used in corners and arched over the furniture and are able to light the entire area. Tripod lamps have a three-legged base and are usually very sturdy. These unique lamps can add an architectural element to your room while providing lighting. These are great in areas that need a little extra lighting. They do have a larger base so they are not the best option for smaller areas. Swing arm lamps come in all sizes and shapes and are very versatile. These lamps can be purchased as desk, table or floor lamps and have an adjustable arm that can be moved to meet your specific needs. They act as a spotlight so that you can shine the light directly where you need it. Torchiere floor lamps are tall and have a shade that faces up to provide accent lighting. These lamps are capable of lighting a larger area than regular floor lamps because the lights bounce off of the ceiling and walls. Piano lamps are typically used on pianos or organs to light up sheet music and keys. They are usually tall and thin with a horizontal bulb cover in a hood and a swing arm so they can easily be adjusted. Piano lamps are also useful as desk and reading lamps. Tree lamps come in a large range of designs. Tree lamps have a central stand with several branches and multiple lights. These lamps are great as an accent piece for a room and the branches are able to give off the light in many directions. The branches are generally adjustable so you can position them according to your needs. No matter what type of room you are trying to light, take into consideration the activities that will be done in that room. Make sure that you choose the proper lighting, based on the style and objective for the room. Determine what lamp will best suit your needs. Always consider the surrounding décor, space, ceiling height. The right lamp is important for functionality and expressing your personal style. 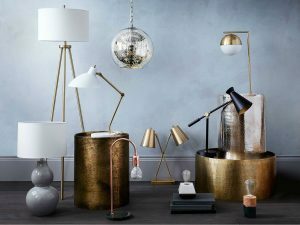 Whether you are trying to create the perfect ambiance or need light for reading or working, a lamp can be that final finishing touch for your room.